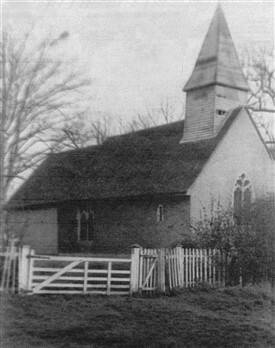 Shopland once had a parish church named St Mary Magdalen. The little Norman church measured only 40 ft by 19ft and was built around the 12th century, of rubble and limestone. It had two small windows. Hundreds of years later four more windows were made. During the 13 and 14th centuries the chancel was widened and two windows and a north door were added. In the 15th Century it was widened, had a bell tower and a fine timber porch built. The bell turret was built in the 16th century, and one bell installed. Sadly the church began to deteriorate by the 20th century. Thanks to the friends of the church a complete restoration began. The old box pews were removed. The blocked up door and windows were re-opened, the walls were re-plastered and painted. In 2014 some visitors to the site were shocked to see the site so overgrown, with bones dug up by the badgers lying around, they decided to tidy the site and find the old foundations. This page was added by Mave Sipple on 14/04/2015. I must have been 8 years old when I saw the dust cloud from a nearby field as the old Church came down. Strangely just after reading this article I found a brief reference in a book which said that upon demolition the porch from the church was re-erected at St Thomas Church, Bradwell on Sea, Essex in 1957. Spent a few days at the CL (Certified Location caravan site) and was interested to know about the history of the old graveyard and church which we understand was demolished in 1950s.